A few weeks ago I set off on a foodie road trip with SEAT, driving around Ireland to visit some amazing local food producers. Armed with only a few podcasts and some energy balls, I drove off one rainy Wednesday morning headed for the West coast. Luckily, in typical Irish fashion, the weather changed completely by the time I arrived at Caherush Point in Co. Clare. Waiting for me, sitting right at the edge of the sea, was Evan Talty from Wild Irish Seaweeds. 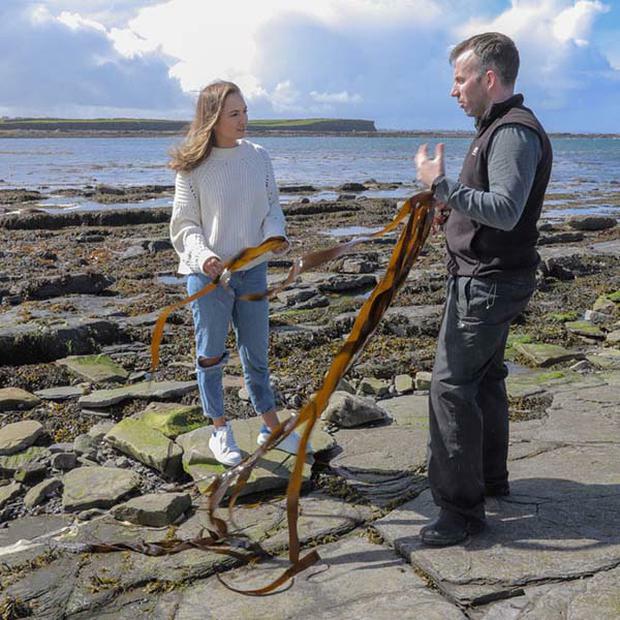 After a quick chat about the family business (Evan’s parents set up the business in 2009), I was dying to get down on the rocks and learn more about the incredible variety of seaweeds we are so lucky to have literally right on our doorsteps. In the last few years, seaweed has become increasingly popular but I feel like a lot of us, including myself, aren’t using enough of it. Using and eating seaweed isn’t too foreign a concept to me, I seem to always buy skincare that touts its benefits and I’ve been using it in broths and sushi for years thanks to my half-Japanese mum, but I still had no idea about the exceptional variety that we have on our shores. Five minutes with Evan and he’d already showed me 6 different types, each with their own unique characteristics but all boasting incredible health benefits. All of the Taltys’ organically certified seaweed grows wildly off the coast and they only harvest it in season to ensure optimum nutrition. Seaweed is a powerhouse of minerals, it’s rich in calcium, zinc, iron, potassium and is often championed for its thyroid and metabolic benefits due to the high levels of selenium and iodine it contains. It’s also high in omega 3s and fibre and has anti-inflammatory properties. Bottom line: we need to use more of it. Kombu is the seaweed that I use the most; it makes beautifully rich stock and it was fascinating to see it in the wild, but I was particularly taken with bladderwrack, which has an unusual shape covered in little sacs. When burst open, it reminded me more of aloe vera than a sea vegetable, as it has a silky smooth gel inside that I couldn’t resist moisturising my hands with. Next was carrageen, probably the most famous of our seaweeds, a red sea moss often used in desserts for its fabulous thickening properties. We also saw popular favourites like dillisk and spirulina before going back inside to look at the different products they sell. They do it all from dried wakame and nori sprinkles to body scrubs and seaweed baths. I loaded up the car with some of each and drove off dreaming about the face mask I’d be relaxing with later. Wild Irish Seaweed products are available in shops nationwide and you can shop online and book a seaweed safari here.